AEM's Exhaust Backpressure install kit is specifically designed for use with AEM's 4-Channel Wideband UEGO Controller to provide accurate air/fuel ratio readings from wideband O2 sensors that are mounted pre-turbo. The Exhaust Backpressure install kit is engineered to provide backpressure readings without sacrificing sensor longevity due to extreme operating conditions. 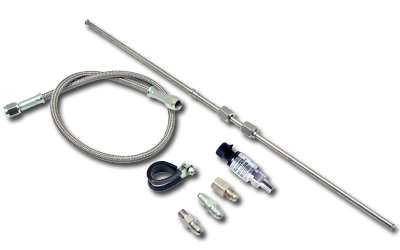 The kit includes an AEM high performance stainless steel 100psig pressure sensor (Part#30-2130-100), stainless steel standoff tube, stainless steel braided hose and fittings.